Albany County (/ˈɔːlbəni/ AWL-bə-nee) is a county in the state of New York, in the United States. Its northern border is formed by the Mohawk River, at its confluence with the Hudson River, which is on the east. As of the 2010 census, the population was 304,204. The county seat is Albany, the state capital of New York. As originally established by the English government in the colonial era, Albany County had an indefinite amount of land, but has had an area of 530 square miles (1,400 km2) since March 3, 1888. The county is named for the Duke of York and of Albany, who became James II of England (James VII of Scotland). 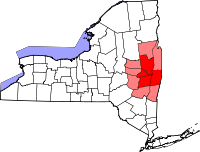 Albany County constitutes the central core of the Capital District of New York State, which comprises the Albany-Schenectady-Troy, NY Metropolitan Statistical Area. After England took control of the colony of New Netherland from the Dutch, Albany County was created on November 1, 1683, by New York Governor Thomas Dongan, and confirmed on October 1, 1691. The act creating the county vaguely defined its territory "to containe the Towns of Albany, the Collony Rensselaerwyck, Schonecteda, and all the villages, neighborhoods, and Christian Plantaçons on the east side of Hudson River from Roelef's Creek, and on the west side from Sawyer's Creek (Saugerties) to the Sarraghtoga." The confirmation declared in 1691 was similar but omitted the Town of Albany, substituted "Mannor of Ranselaerswyck" for "Collony Rensselaerwyck", and stated "to the uttermost end of Sarraghtoga" instead of just "to Sarraghtoga". Livingston Manor was annexed to Albany County from Dutchess County in 1717. Albany's boundaries were defined more closely as state statutes would add land to the county, or more commonly subtract land for the formation of new counties. In 1772 with the creation of Tryon and Charlotte counties, Albany gained definitive boundaries and included what are now Albany, Columbia, Rensselaer, Saratoga, and Schenectady counties; large parts of Greene and Washington counties; and the disputed southwest corner of Vermont. The city of Albany was the first municipality within this large county, founded as the village (dorp in Dutch) of Beverwyck by the Director-General of New Amsterdam, Pieter Stuyvesant, who also established the first court in Albany. Albany was established as a city in 1686 by Governor Dongan through the Dongan Charter after the English took over the colony. Schenectady to the west was given a patent with some municipal rights in 1684 and became a borough in 1765. The Manor of Rensselaerswyck was created as a district within the county in 1772, and later divided into two districts, one on each side of the Hudson River in 1779. The west district included all of what is now Albany County other than lands were in the city of Albany at the time. Though the Manor of Rensselaerswyck was the only district (along with the city of Albany) in what is today Albany County, it was not the only district in what was Albany County at the time. Pittstown in 1761, and Duanesburgh in 1764, were created as townships. But when districts were created in 1772, those townships were incorporated into new districts, Pittstown in Schaghticoke and Duanesburgh into the United Districts of Duanesburgh and Schoharie. Schenectady was also made from a borough to a district in 1772. Other districts established in 1772 were Hoosick, Coxsackie, Cambridge, Saratoga, Halfmoon, Kinderhook, Kings, Claverack, Great Imboght, and the Manor of Livingston. In a census of 1697, there were 1,452 individuals living in Albany County; two years later it would be counted as 2,016 at the beginning of King William's War. By the end of the war in 1698, the population had dropped to 1,482, but rebounded quickly and was at 2,273 by 1703. By 1723, it had increased to 6,501 and in 1731 to 8,573, which was slightly less than the population of the city of New York in the same year. In 1737, the inhabitants of Albany County would outnumber those of New York County by 17 people. In 1774, Albany County, with 42,706 people, was the largest county in colonial New York. According to the first Federal Census in 1790, Albany County reached 75,921 inhabitants and was still the state's largest county. On March 7, 1788, the state of New York divided the entire state into towns eliminating districts as administrative units by passing New York Laws of 1788, Chapters 63 and 64. Albany County was one of the original twelve counties created by the Province of New York on November 1, 1683. At the time, it included all of New York state north of Dutchess and Ulster counties, all of what is now Bennington County in Vermont, and theoretically west to the Pacific Ocean. On May 27, 1717, Albany County was adjusted to gain an indefinite amount of land from Dutchess County and other non-county lands. On October 7, 1763, King George III, as part of his Proclamation of 1763, created the new province of Quebec, implicitly setting the northern limit of New York at the parallel of 45 degrees north latitude from the Atlantic-St. Lawrence watershed westward to the St. Lawrence River, implicitly setting the northern limit of Albany County, but it was never mapped. On July 20, 1764, King George III established the boundary between New Hampshire and New York along the west bank of the Connecticut River, north of Massachusetts and south of the parallel of 45 degrees north latitude. Albany County implicitly gained present-day Vermont. Although disputes occasionally broke out later, this line became the boundary between New Hampshire and Vermont, and has remained unchanged to the present. When New York refused to recognize land titles through the New Hampshire Grants (towns created earlier by New Hampshire in present Vermont), dissatisfied colonists organized in opposition, which led to the creation of independent Vermont in 1777. On July 3, 1766, Cumberland County was partitioned from Albany County to cover all territory to the northern and eastern limits of the colony, including Windsor County, most of Windham County, and parts of Bennington and Rutland counties in present-day Vermont. On June 26, 1767, Albany County regained all of Cumberland County. On March 19, 1768, Albany County was re-partitioned, and Cumberland County restored. On March 16, 1770, Albany County was again partitioned. Gloucester County was created to include all of Orange, Caledonia and Essex counties, most of Washington County, and parts of Orleans, Lamoille, Addison and Chittenden counties in present-day Vermont. On March 12, 1772, Albany County was partitioned again, this time into the counties of Albany, Tryon (now Montgomery), and Charlotte (now Washington). This established a definite area for Albany County of 5,470 sq mi (14,200 km2). On March 24, 1772, Albany County was partitioned again, with an additional 50 square miles (130 km2) handed over to Cumberland County. On March 9, 1774, Albany County was partitioned again, this time passing 1,090 square miles (2,800 km2) to Ulster County. On April 1, 1775, Albany was again partitioned, this time giving up 60 square miles (160 km2) to Charlotte County, who then exchanged this land with a like parcel in Cumberland County. On January 15, 1777, Albany County was again partitioned, this time on account of the independence of Vermont from New York, reducing Albany County by an additional 300 square miles (780 km2). On June 26, 1781, Bennington County, Vermont, attempted to annex a portion of Albany County that today includes portions of Washington and Rensselaer counties to form what they called "The West Union". The fledgling United States – under the Articles of Confederation – arbitrated this annexation, and condemned it, resulting in Vermont ceasing the annexation on 1782-02-23. On April 4, 1786, Columbia County was created from 650 square miles (1,700 km2) of Albany County land. On March 7, 1788, New York, refusing to recognize the independence of Vermont, and the attendant elimination of Cumberland County, attempted to adjust the line that separated Cumberland from Albany County in present-day Vermont, but to no effect. On February 7, 1791, Albany County was partitioned again, this time to form Rensselaer and Saratoga counties. Rensselaer received 660 square miles (1,700 km2), while Saratoga received 850 square miles (2,200 km2). Also the town of Cambridge was transferred to Washington County. A total of 1,680 square miles (4,400 km2) changed hands. On June 1, 1795, Albany County was once again partitioned, this time losing 460 sq mi (1,200 km2) to Schoharie County. On April 5, 1798, another partition took place, with 90 square miles (230 km2) passing to Ulster County. On March 25, 1800, once again Albany County was partitioned, with 360 square miles (930 km2) being used to create Greene County. On April 3, 1801, all New York counties were redefined, with Albany County gaining 10 sq mi (26 km2). On March 3, 1808, Albany County turned Havre Island over to Saratoga County, with no resultant loss in land. On March 7, 1809, Schenectady County was created from 230 square miles (600 km2) of Albany County land, reducing Albany County to its current size. According to the U.S. Census Bureau, the county has a total area of 533 square miles (1,380 km2), of which 523 square miles (1,350 km2) is land and 10 square miles (26 km2) (2.0%) is water. Albany County is in the east central part of New York, extending southward and westward from the point where the Mohawk River joins the Hudson River. Its eastern boundary is the Hudson; a portion of its northern boundary is the Mohawk. The terrain of the county ranges from flat near the Hudson and Mohawk Rivers to high and hilly to the southwest, of the Helderberg Escarpment and the Helderberg Mountains. The highest point is one of several summits near Henry Hill at approximately 2,160 feet (658 m) above sea level; The lowest point is 62 feet (19 m) above sea level at the Hudson River's southernmost extent in the county. The Capital District has a humid continental climate, with cold, snowy winters, and hot, wet summers. Albany receives around 36.2 inches (920 mm) of rain per year, with 135 days of at least 0.01 inches (0.25 mm) of precipitation. Snowfall is significant, totaling about 63 inches (1,600 mm) annually, but with less accumulation than the lake-effect areas to the north and west, being far enough from Lake Ontario. Albany County is however, close enough to the coast to receive heavy snow from Nor'easters, and the region gets the bulk of its yearly snowfall from these types of storms. The county also occasionally receives Alberta clippers. Winters are often very cold with fluctuating conditions, temperatures often drop to below 0 °F (−18 °C) at night. Summers in the Albany can contain stretches of excessive heat and humidity, with temperatures above 90 °F (32 °C) and dew points near 70. Severe thunderstorms are common but tornadoes are rare. Albany receives on average per year 69 sunny days, 111 partly cloudy days, and 185 cloudy days; and an average, over the course of a year, of less than four hours of sunshine per day, with just over an average of 2.5 hours per day over the course of the winter. The chance during daylight hours of sunshine is 53%, with the highest percentage of sunny daylight hours being in July with 64%, and the lowest month is November with 37%. Albany County has a myriad of different architectural styles spanning centuries of development. Within the city of Albany alone there is Dutch Colonial (the Quackenbush House), French Renaissance (the New York State Capitol), Federal style (the original Albany Academy in Academy Park), Romanesque Revival (Albany City Hall), Art deco (the Alfred E. Smith Building), and Modern (Empire State Plaza). The cities of Albany, Cohoes, and Watervliet and the village of Green Island are more urban in architecture; while the towns of Colonie, Guilderland, New Scotland, and Bethlehem more suburban and the remaining Hilltowns (Berne, Knox, Westerlo, and Rensselaerville) very rural. Albany County is home to the Emma Treadwell Thacher Nature Center, which opened in July 2001 and is near the shore of Thompson's Lake between the two state parks that are in Albany County- Thompson's Lake State Park and John Boyd Thacher State Park. There are also state-owned nature preserves with interactive educational programs such as the Five Rivers Environmental Education Center and the Albany Pine Bush. The cities, towns, and villages of Albany County have many municipal parks, playgrounds, and protected green areas. Washington Park in the city of Albany and The Crossing in the town of Colonie are two of the largest. There are many small hiking and biking trails and longer distance bike-hike trails such the Mohawk-Hudson Bike-Hike Trail which goes from the city of Albany north to Cohoes and then west along the Mohawk River to Schenectady County. One of the largest events in Albany County is the Tulip Fest held in the city of Albany every spring at Washington Park. The tradition stems from when Mayor Erastus Corning 2nd had a city ordinance passed declaring the tulip as Albany's official flower on July 1, 1948. The African-American tradition of Pinksterfest, whose origins are traced back even further to Dutch festivities, was later incorporated into the Tulip Fest. The Albany LatinFest has been held since 1996 and drew 10,000 to Washington Park in 2008. PolishFest is a three-day celebration of Polish culture in the Capital District, held in the town of Colonie for the past eight years. Albany County has two shopping malls classified as super-regional malls (malls with over 800,000 sq ft), Crossgates Mall in Guilderland and Colonie Center in Colonie with over one million square feet of rentable space in each. Huck Finn's Playland is in Albany's Warehouse District just north of downtown Albany. Huck Finn's Playland is a children's amusement park open during the summer. Huck Finn's started operations in the Summer of 2015, after purchasing the rides from the former Hoffman's Playland in Newtonville, which was in operation from 1951 to the Fall of 2014. During the winter there are over 18 miles (29 km) of official trails for snowshoeing at the Albany Pine Bush Preserve, in the city of Albany and towns of Colonie and Guilderland. Albany is often derided as "Smallbany" (also spelled Smalbany) for its perceived lack of culture and as a backwater in tourism circles, even though it consistently ranks high on lists of top cities/metro areas for culture, such as being 23rd in the book Cities Ranked & Rated. To locals the Smallbany title references the perceived notion residents are interconnected and know each other in some way. Albany is home to some of the oldest museums, historical sites, and places of worship in the state of New York and the United States; some of the finest collections of historical artifacts and art can be found in Albany County. There are several art museums in Albany County; including the Albany Center Gallery, in downtown Albany, which exhibits works by local artists within a 100-mile (160 km) radius of that city; the University Art Museum, at the University at Albany, SUNY; and the Opalka Gallery, at the Sage College of Albany. The Empire State Plaza in Albany has one of the most important state collections of modern art in the U.S.
Albany County itself owns the largest venue for performing arts in the county, the Times Union Center, which was originally built as the Knickerbocker Arena; it opened on January 30, 1990, with a performance by Frank Sinatra. In 1996, The Grateful Dead released a concert album from their March 1990 performances titled Dozin' at the Knick. Many athletes and coaches in major sports have begun their careers in Albany County. Phil Jackson, former NBA head coach of the Chicago Bulls and Los Angeles Lakers won his first championship ring as a coach when he guided the Albany Patroons to the 1984 CBA championship. Three years later, the Patroons completed a 50–6 regular season, including winning all 28 of their home games; at that time, Sacramento Kings head coach George Karl was the Patroons' head coach. Future NBA stars Mario Elie and Vincent Askew were part of that season's squad. Mike Tyson received his early training in the Capital District and his first professional fight was in Albany in 1985 and Tyson's first televised fight was in Troy in 1986. He fought professionally four times in Albany and twice each in Troy and Glens Falls between 1985 and 1986. Albany County was originally settled primarily by Protestants from northern Europe: the Netherlands, British Isles, and Germany. In the 19th century it was a destination for many Catholic immigrants, first from Ireland – fleeing the Great Famine, and later from southern Germany, central and southern Europe. Late 19th and early 20th century immigrants included Jews from eastern Europe. In addition to other Jewish congregations, the county has one of the few Karaite Jewish communities outside Israel. This community is active and has its own synagogue. As of the census of 2010, there were 304,204 people, 124,682 households, and 74,521 families residing in the county. The population density was 563 people per square mile (217/km²). There were 134,072 housing units at an average density of 248 per square mile (96/km²). The racial makeup of the county was 78.2% White, 12.7% Black or African American, 0.2% Native American, 4.8% Asian, 0.0% Pacific Islander, 1.6% from other races, and 2.5% from two or more races. 4.9% of the population were Hispanic or Latino of any race. 19.2% were of Irish, 16.0% Italian, 11.0% German, 6.1% English and 5.1% Polish ancestry according to Census 2000. 90.4% spoke English, 2.7% Spanish and 1.0% Italian as their first language. There were 124,682 households out of which 28.9% had children under the age of 18 living with them, 43.2% were married couples living together, 12.2% had a female householder with no husband present, and 41.1% were non-families. 33.0% of all households were made up of individuals and 11.3% had someone living alone who was 65 years of age or older. The average household size was 2.32 and the average family size was 2.99. In the county, the age distribution of the population shows 22.6% under the age of 18, 11.3% from 18 to 24, 28.8% from 25 to 44, 22.8% from 45 to 64, and 14.5% who were 65 years of age or older. The median age was 37 years. For every 100 females there were 91.7 males. For every 100 females age 18 and over, there were 87.8 males. The median income for a household in the county was $42,935, and the median income for a family was $56,724. Males had a median income of $39,838 versus $30,127 for females. The per capita income for the county was $23,345. About 7.2% of families and 13.1% of the population were below the poverty line, including 14.9% of those under age 18 and 6.3% of those age 65 or over. Since the 2000s, the economy of Albany County and the surrounding Capital District has been redirected toward high technology. Tech Valley is a marketing name for the eastern part of New York State, encompassing Albany County, the Capital District, and the Hudson Valley. Originated in 1998 to promote the greater Albany area as a high-tech competitor to regions such as Silicon Valley and Boston, it has since grown to represent the counties in the Capital District and extending to IBM's Westchester County plants in the south and the Canada–US border to the north. The area's high technology ecosystem is supported by technologically focused academic institutions including Rensselaer Polytechnic Institute and the State University of New York Polytechnic Institute. Tech Valley encompasses 19 counties straddling both sides of the Adirondack Northway and the New York Thruway, and with heavy state taxpayer subsidy, has experienced significant growth in the computer hardware side of the high-technology industry, with great strides in the nanotechnology sector, digital electronics design, and water- and electricity-dependent integrated microchip circuit manufacturing. Albany County was governed by an elected board of supervisors until 1967. On January 1, 1968, a 39-member county legislature was established. On January 1, 1976, Albany County government was changed by a new county charter establishing provisions for a county executive elected at-large, in addition to the 39-seat county legislature. Each of the 39 members are elected from single-member districts. As of 2015, the county council has 29 Democrats, 9 Republicans and 1 Conservative, who caucuses with the Republicans. The County Executive is Daniel P. McCoy (D) and the Chair of the Legislature is Shawn Ward (D). Other officials elected countywide include Sheriff Craig Apple, District Attorney David Soares, Clerk Bruce A. Hidley, and Comptroller Michael F. Conners. Albany County has long been at the forefront of transportation technology from the days of turnpikes and plank roads to the Erie Canal, from the first passenger railroad in the state to the oldest municipal airport in the United States. Today, Interstates, Amtrak, and the Albany International Airport continue to make the Albany County a major crossroads of the Northeastern United States. The Capital District Transportation Committee (CDTC) is the Metropolitan Planning Organization (MPO) for the Albany-Schenectady-Troy Metropolitan Statistical Area (MSA). Every metropolitan area in the United States with a population of over 50,000 must have a MPO in order to get any federal transportation funding. The US Department of Transportation (USDOT) uses an MPO to make decisions on what projects are most important to a metro area for immediate versus long term funding. The USDOT will not approve federal funds for transportation projects unless they are on an MPO's list. Albany County is situated at a major crossroads of the Northeastern United States, first formed by the Mohawk and Hudson rivers. Even before the Interstate Highway System and the U.S. Highway system, Albany County was the hub of many turnpikes and plank roads that connected the region, as well as the Erie Canal reaching the Great Lakes. Today, Interstate 87 and Interstate 90 meet in Albany County. The Thomas E. Dewey New York State Thruway is a toll-road that from Exit 24 in the city of Albany is I-87 and travels south to connect the county with downstate New York. West from Exit 24, the Thruway is I-90 and connects the county with Schenectady, Utica, Syracuse, Rochester, and Buffalo. North of Exit 24, I-87 is the Adirondack Northway and connects the city and county of Albany with their suburbs in Saratoga County and provides long-distance travel to Montreal. East of Exit 24, I-90 travels along the northern boundary of the city of Albany and exits the county on the Patroon Island Bridge into Rensselaer County to access Albany's eastern suburbs. Interstate 787 connects the Thruway (I-87) to Downtown Albany, Menands, Watervliet, and Cohoes. U.S. Route 9 enters the county on the Dunn Memorial Bridge and travels through the city of Albany north, connecting it with the suburbs in the Colonie and Saratoga County. U.S. Route 20 also enters the county on the Dunn Memorial Bridge and travels west through Albany (city) and the Town of Guilderland. New York State Route 5 and New York State Route 7 are two important highways that bisect the county and are developed as important shopping strips. Albany County is served by the Capital District Transportation Authority, a four-county bus service that also serves Rensselaer, Schenectady, and Saratoga counties. Greyhound Lines, Trailways, and Peter Pan/Bonanza buses all serve a downtown terminal. A Chinatown bus service leaves from Central Avenue and provides service to Chinatown in Manhattan. Albany International Airport is the only commercial airport in the county. Destinations for flights out of Albany include Atlanta; Las Vegas; Chicago; Charlotte, North Carolina; and Orlando, Florida, among many others. Since 1968 when Union Station in the city of Albany was abandoned for a new station across the Hudson in the city of Rensselaer, Albany County has been without a train station. Amtrak has several routes serving the Albany-Rensselaer Station. The Adirondack (north to Montreal, Quebec and south to the city of New York), Empire Service (west to Buffalo and Niagara Falls, south to New York), Ethan Allen Express (northeast to Rutland, Vermont and south to New York), Maple Leaf (west to Toronto and south to New York), and the Lake Shore Limited (at Albany-Rensselaer separate routes from Boston and New York merge to one train west to Chicago, on way east one train splits to two, one east to Boston and another south to New York). Albany County is composed of three cities and 10 towns. ^ a b "State & County QuickFacts". United States Census Bureau. Archived from the original on July 6, 2011. Retrieved October 11, 2013. ^ George Howell and Jonathan Tenney (1886). Bi-Centennial History of Albany. W.W. Munsell. p. 12. Retrieved 2009-08-28. ^ a b George Howell and Jonathan Tenney (1886). Bi-Centennial History of Albany. W.W. Munsell. p. 70. Retrieved 2009-08-28. ^ a b c George Howell and Jonathan Tenney (1886). Bi-Centennial History of Albany. W.W. Munsell. p. 71. Retrieved 2009-08-28. ^ a b c David Kendall Martin (Fall 1990). "The Districts of Albany County, New York, 1772–1784". The New York Genealogical and Biographical Society. Retrieved 2009-08-30. ^ Barnes, William (1851). The Settlement and Early History of Albany. Gould, Banks, & Gould. p. 17. ^ George Howell and Jonathan Tenney (1886). Bi-Centennial History of Albany. W.W. Munsell. p. 72. Retrieved 2009-08-28. ^ French, John (1860). Gazetteer of the State of New York. R. Pearsall Smith. p. 598. Retrieved 2009-08-30. ^ "Albany County". New York State Museum. Retrieved 2009-08-30. ^ (state), New York (1788). Laws of the State of New York. State of New York. p. 748. Retrieved 2009-08-31. ^ a b Thorne, Kathryn Ford, Compiler & Long, John H., Editor: New York Atlas of Historical County Boundaries; The Newbury Library; 1993. ^ (N.Y. Col. Laws, ch 333/1:915). ^ (Cappon, Petchenik, and Long, 1, 77, 90; Shortt and Doughty, 119—120). ^ (Slade, 13—19; Van Zandt, 63). ^ (N.Y. Col. Laws, ch. 1297/4:904). ^ (N.Y. Col. Laws, ch. 1297/4:903). ^ (N.Y. Col. Laws, ch. 1559/5:400). ^ (N.Y. Col. Laws, ch. 1559/5:401). ^ (N.Y. Col. Laws, ch. 1534/5:321). ^ (N.Y. Col. Laws, ch. 1559/5:402). ^ (N.Y. Col. Laws, ch. 1665/5:662). ^ (N.Y. Col. Laws, ch. 1719/5:779). ^ (Slade, 70–73; Van Zandt, 64; C. Williamson, 82–84, map facing 95, 100–102, 112–113). ^ (Vt. State papers, 13:45–46). ^ (Vt. State papers, vol 3, pt. 2; pp. 67–68). ^ (N.Y. Laws 1786, 9th sess., ch. 28/p. 49). ^ (N.Y. Laws 1788, 11th sess., ch. 63/pp. 746–747). ^ (N.Y. Laws 1791, 14th sess., ch. 4/p. 201). ^ (N.Y. Laws 1795, 18th sess., ch. 42/p. 588). ^ (N.Y. Laws 1798,21st sess., ch. 93/p. 273). ^ (N.Y. Laws 1800, 23rd sess., ch. 59/p. 503). ^ (N.Y. Laws 1801,24th sess., ch. 123/p. 290). ^ (N.Y. Laws 1888, 111th sess., ch. 42/p. 85). ^ (N.Y. Laws 1808, 32nd sess., ch. 65, sec. 1/p. 458). ^ "Monthly Averages for Albany, NY". Ustravelweather.com. 2008. Archived from the original on 2008-06-11. Retrieved 2008-09-26. ^ a b "Climate information for Albany, New York". climate-zone.com. Archived from the original on 11 May 2009. Retrieved 2009-06-06. ^ "Cloudiness". University of Utah, Department of Atmospheric Sciences. Archived from the original on March 26, 2009. Retrieved 2009-06-06. ^ "Sunshine Hours Page". Archived from the original on 15 May 2009. Retrieved 2009-06-06. ^ "Albany Tulip Queen". Albany Tulip Queen.com. Archived from the original on 19 May 2009. Retrieved 2009-06-07. ^ "About Albany Latin Fest". Albany Latin Festival. Archived from the original on 16 June 2009. Retrieved 8 June 2009. ^ International Council of Shopping Centers Archived 2009-03-25 at the Wayback Machine Shopping Center Definitions for the U.S. Information accurate as of 2004. Retrieved February 20, 2007. ^ "Enjoy the Albany/Capital District on snowshoes". Albany.com. Retrieved 2009-06-09. ^ Campbell, Jeff (2008). USA. Lonely Planet. p. 184. ISBN 978-1-74104-675-5. Retrieved 2009-06-01. ^ "America's Top Cities for Culture". Move, Inc. Retrieved 2009-06-04. ^ "The History of the Albany Institute of History from the 1700s to the Present". Albanyinstitute.org. 1999-06-01. Archived from the original on 2012-02-29. Retrieved 2012-04-29. ^ "Support the New York State Museum". New York State Museum. Archived from the original on 2009-06-03. Retrieved 2009-05-30. ^ "About Us". Albany Center Gallery. Retrieved 2009-11-25. ^ "Empire State Plaza Art Collection". New York State Office of General Services. Archived from the original on August 22, 2012. Retrieved July 24, 2012. ^ "Dozin' at the Knick". Dead101.com. Retrieved 2012-04-29. ^ Telushkin, S. (2016). The Jews You've Never Heard Of. Tablet. ^ "American FactFinder". Factfinder.census.gov. Retrieved 2012-04-29. ^ Larry Rulison (July 10, 2015). "Made in Albany: IBM reveals breakthrough chip made at SUNY Poly". Albany Times-Union. Retrieved July 12, 2015. ^ "3 more counties adopt charters". The New York Times. 1973-11-25. p. 59. ^ "Capital District Transportation Committee". Capital District Transportation Committee. Retrieved 2009-04-23. Wikimedia Commons has media related to Albany County, New York. This page was last edited on 26 February 2019, at 04:04 (UTC).